Recent commercial satellite imagery shows that during the last several months no significant alterations have taken place at the Parchin military site. At least one building at this site is alleged to have been the location of high explosive tests related to the development of nuclear weapons prior to 2004. A November 27, 2013 image shows that the areas that had previously been asphalted remain unchanged compared to an image from August 13, 2013 (see figures 1 and 2). A central area remains unpaved. In sum, no significant changes could be found at the site in the November image. We cannot see what is happening inside the buildings but the image does not show any activity associated with large-scale alterations inside the buildings. Since February 2012, ISIS has monitored developments at the Parchin complex using commercial satellite imagery to catalog changes at the site. These results are in reports available on the ISIS website. 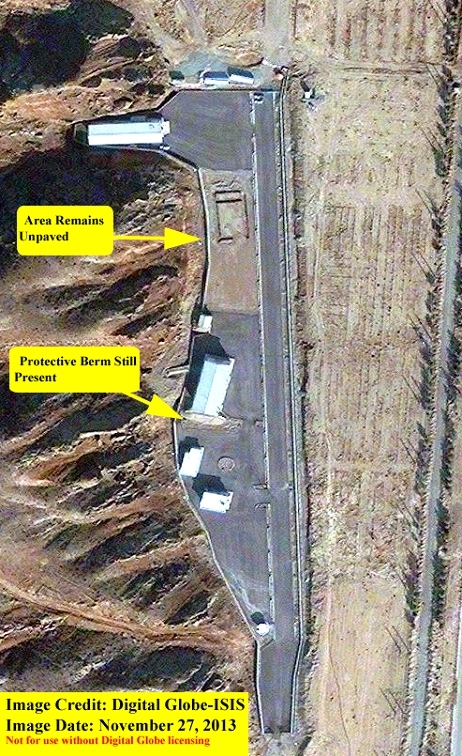 The imagery shows that between early 2012 and the summer of 2013 Iran sanitized, demolished portions of, and reconstructed the site in an apparent effort to hide past activities and undermine the International Atomic Energy Agency’s (IAEA’s) ability to conduct verification activities (compare figures 2 and 3). 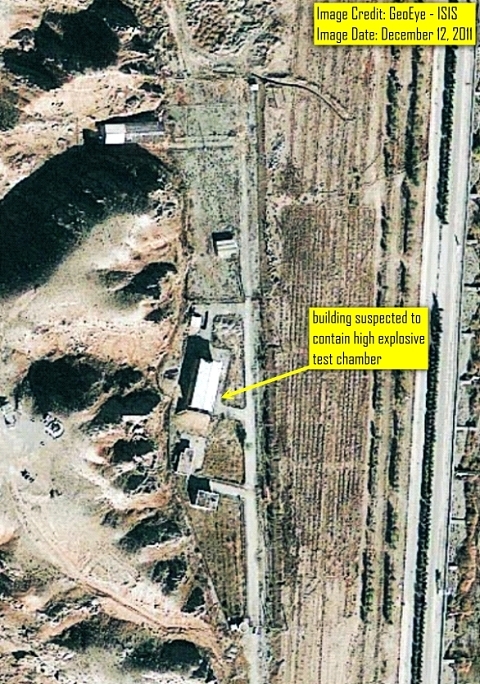 The apparent lack of additional visible changes in the November 27, 2013 image may mean that Iran has finished making planned changes at the site. On the other hand, it could represent an effort by Iran to freeze operations there. Nonetheless, the IAEA faces a tough challenge in inspecting this site. As a result, Iran will need to cooperate by answering the IAEA’s questions and providing access to Iranian officials, scientists and engineers linked to the alleged nuclear weaponization work at Parchin. Iran may also need to allow inspections of other sites linked to the IAEA’s concerns about the activities at the Parchin site. On November 11, 2013, Iran and the IAEA signed a Joint Statement on a Framework for Cooperation whereby “Iran and the IAEA will cooperate further with respect to verification activities to be undertaken by the IAEA to resolve all present and past issues.” One of the major issues to be resolved under this agreement is the former activities at the Parchin military complex. As the Agency [IAEA] has repeatedly made clear to Iran, the extensive activities that Iran has undertaken at the aforementioned location on the Parchin site have seriously undermined the Agency’s ability to conduct effective verification. It remains essential that Iran provide substantive answers to the Agency’s detailed questions regarding Parchin and the foreign expert [alleged to have assisted Iran’s experiments there], as requested by the Agency…and provide access to the location, without further delay. As the IAEA and Iran embark on negotiating additional steps under the recent November 2013 Joint Statement, the priority is addressing the IAEA’s concerns about the activities at the Parchin site. Figure 1. Digital Globe imagery shows the status of the alleged high explosive test site at the Parchin military complex on November 27, 2013. Figure 2. Digital Globe imagery shows the status of the alleged high explosive test site at Parchin in August 2013. Figure 3. 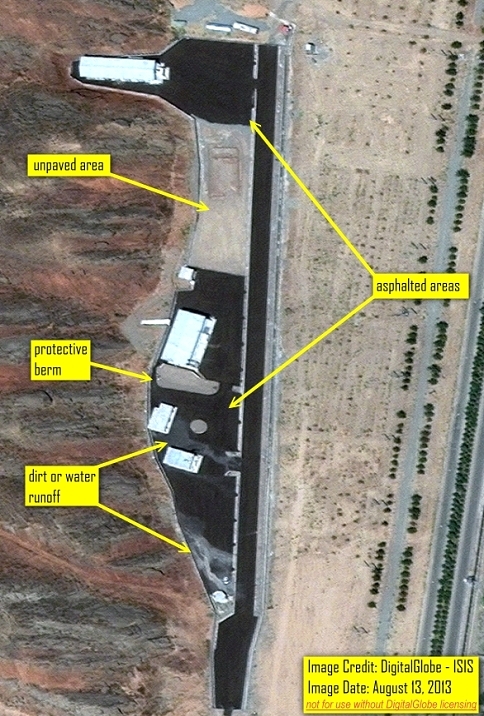 GeoEye imagery dated December 12, 2011 showing original buildings, security perimeter, and layout of Iran’s Parchin site prior to the February 2012 IAEA request to access the site. After this request, Iran undertook a series of construction efforts to alter the site. These resulted in the complete alteration of the internal layout, modification and demolition of several buildings, and construction of a new security perimeter.